235 Commonwealth is located on the north side of Commonwealth, between Exeter and Fairfield, with 233 Commonwealth to the east and 239 Commonwealth (22 Fairfield) to the west. 235 Commonwealth was designed by architect Obed F. Smith and built in 1882-1883 by Vinal & Dodge, masons, as the home of George Wheatland, Jr., and his wife, Florence Saumarez (Dumaresq) Wheatland. He is shown as the owner of 235 Commonwealth on the original building permit application, dated December 1, 1882. George Wheatland, Jr., purchased the land for 235 Commonwealth on October 4, 1882, from Nathaniel Thayer, Jr. It was the eastern 21 feet of a 26.63 foot lot that Nathaniel Thayer, Jr., purchased on April 30, 1881, from Frederick Sears Grand d’Hauteville. He combined the western 5.63 feet with another lot and built his home at 239 Commonwealth (22 Fairfield). On May 10, 1881, Nathaniel Thayer, Jr., and Frederck Sears Grand d’Hauteville agreed that, for a period of twenty years, no stable would be built on the land where 235 Commonwealth and 239 Commonwealth subsequently would be built. The restriction was for the benefit of the owner of land at 233 Commonwealth, which Frederick Sears Grand d’Hauteville continued to own. 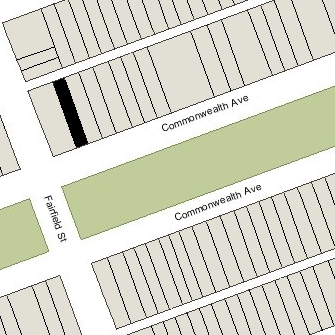 The land for 235 Commonwealth was part of a larger parcel on which 233-235-239 Commonwealth subsequently were built. It was originally purchased from the Boston Water Power Company on February 16, 1863, by Daniel Davies, Jarvis Dwight Braman, and Grenville Temple Winthrop Braman. Grenville Braman was treasurer of the Boston Water Power Company, Jarvis Braman was his brother (and later president of the company), and Daniel Davies, a housewright and master carpenter, was Grenville Braman’s father-in-law. Click here for an index to the deeds for 235 Commonwealth. By the 1884-1885 winter season, George and Florence Wheatland had made 235 Commonwealth their home They previously had lived at 265 Beacon. George Wheatland, Jr., was a building contractor and real estate developer. Bainbridge Bunting’s Houses of Boston’s Back Bay credits him with building more than 140 houses in the Back Bay and Bay State Road neighborhoods between 1867 and 1907. The Wheatlands’ three children — Philip D. Wheatland, Florence Dumaresq Wheatland, and George Wheatland, III — lived with them. Philip Wheatland, a stockbroker, married in June of 1887 to Alice Ellerton Pratt; after their marriage, they lived at 8 West Cedar. Florence Wheatland married in November of 1889 to Jacob Crowninshield Rogers Peabody; after their marriage, they lived in Danvers. George Wheatland, III, married in October of 1896 to Rebecca Rogers; after their marriage, they lived in Salem. The Wheatlands continued to live at 235 Commonwealth during the 1892-1893 winter season, but moved thereafter. By the 1896-1897 season, they were living in a new house they had built at 329 Commonwealth. During the 1893-1894 and 1894-1895 winter seasons, 235 Commonwealth was the home of dry goods commission merchant Joseph Sargent, Jr., and his wife, Nellie Louise (McClure) Sargent. They had lived at 316 Beacon in 1892. They had moved to 441 Beacon by the 1895-1896 season. On September 13, 1895, 233 Commonwealth was purchased from George Wheatland, Jr., by Margaret Randolph (Anderson) Rotch, the wife of Abbott Lawrence Rotch. They previously had lived at 265 Commonwealth. Abbott Lawrence Rotch was a professor of meteorology at Harvard and founder of the Blue Hill Meteorological Observatory. Abbott Lawrence Rotch died in April of 1912. 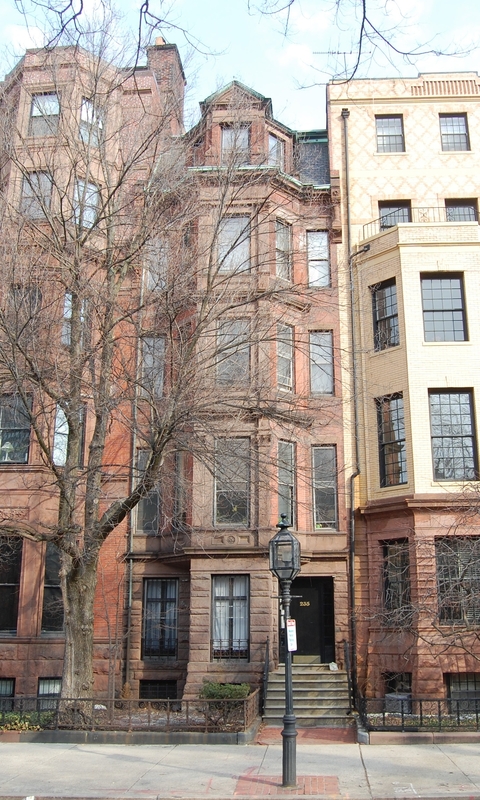 Margaret Rotch continued to live at 235 Commonwealth during the 1912-1913 winter season, but moved thereafter to 182 Beacon, which he had purchased in September of 1911. She continued to own 235 Commonwealth. 235 Commonwealth was not listed in the 1914-1922 Blue Books. Margaret Rotch married again in November of 1919, to Henry Parkman, Jr., an attorney. They lived at 182 Beacon after their marriage. On June 20, 1922, 235 Commonwealth was acquired from Margaret Parkman by Gerald Arthur Bramwell. He and his wife, Emily Faithful (Ames) Bramwell, made it their home. They previously had lived at 15 Hereford. They also maintained a home in York Harbor, Maine. A former banker, Gerald Bramwell was treasurer of the American Felt Company. They continued to live at 235 Commonwealth in 1930, but had moved to New York City by 1931. The house was not listed in the 1931-1937 Blue Books and is shown as vacant in the 1931-1935 City Directories. On January 25, 1935, the Suffolk Savings Bank for Seamen and Others foreclosed on its mortgage to Gerald Bramwell and took possession of 235 Commonwealth. In April of 1935, John A. McNamara, a real estate manager acting on behalf of the bank, applied for (and subsequently received) permission to convert the property from a single-family dwelling into eleven apartments. In May of 1935, he amended the plans to reduce the number of units to ten. On May 29, 1940, 235 Commonwealth was acquired from the Suffolk Savings Bank by Miss Beatrice Antonetta Bortone, one of eight Back Bay properties she acquired from the bank at the same time. She was a bookkeeper with Leopold Morse & Co., wholesale and retail clothiers. She lived in Wayland with her parents, Anthony C. Bortone and Maria (Larocca) Bortone. In 1946, she married Albert DeStefano. After their marriage, they lived in Newton. 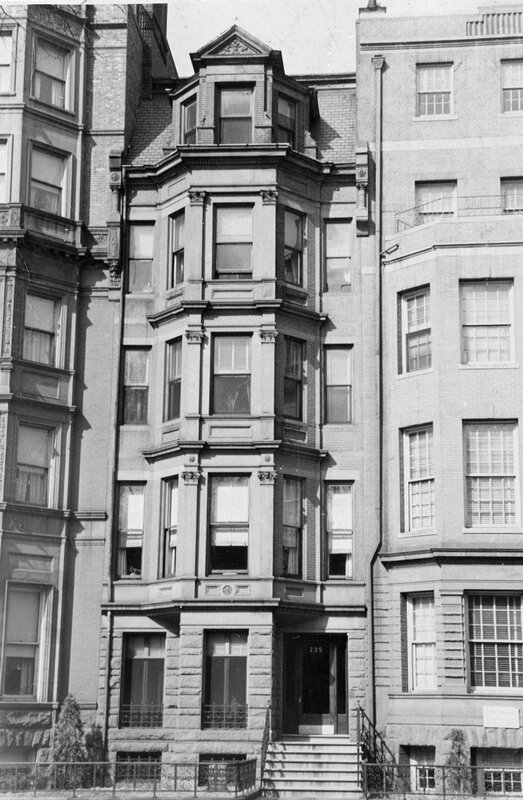 On August 28, 1957, 235 Commonwealth was acquired from Beatrice (Bortone) DeStefano by real estate dealer Overton W. Ogilvie, who also acquired most of her other Back Bay properties on the same day. On March 6, 1958, 235 Commonwealth and several other properties were acquired from Overton Ogilvie by Charles M. Rhodes. Five days later, the properties were acquired from him by real estate dealer and future hotel owner Isaac M. Saunders and his sons, Roger A. Saunders and Donald L. Saunders. On March 19, 1959, 235 Commonwealth was acquired from the Saunderses by Richard L. Welch, trustee of the Omega Trust. On April 6, 1967, 235 Commonwealth was acquired from Richard Welch by Vasilios Poulos. On August 10, 2008, Vasilios Poulos and his wife, Flora Poulos, transferred the property to Vasilios Poulos as trustee of the Vasilios Poulos Revocable Intervivos Trust. 235 Commonwealth remained an apartment house in 2016.